The narrow side streets of the Financial District highlight its status as the oldest neighborhood in New York City, while its stunning architecture and the sheer size of the towers that rise along those streets reflect the Financial District's more recent history as a hub of capitalism and the center of the financial world. Look closer, though, and you'll quickly see that between City Hall Park on the North and the bottom of Manhattan Island on the South, the Financial District has quietly emerged as one of the most luxurious residential neighborhoods in all of Manhattan, and is home to some of the most desirable rental listings in New York City. While many of the Financial District's grand towers remain bastions of big business, many others have been converted in recent years into condominium developments or luxury rental buildings, and the number of people living in the district has skyrocketed. And thanks to an influx of upscale shopping and restaurants and bars that range from posh to endearingly down-home, the New Yorkers who have flocked to the Financial District are living well in one of the most historically significant neighborhoods in Manhattan. In some instances, they're even living in history. The sleek limestone skyscraper at 20 Exchange Place is both a New York City landmark and one of the hottest no-fee rentals in lower Manhattan. The elegant apartments for rent at 2 Gold Street offer ultra-modern luxury on one of Manhattan's oldest thoroughfares. More of the finer flats for rent in the Financial District can be found in the office-to-apartment conversion at 45 Wall Street has been and the Gothic Revival former headquarters of U.S. Steel at 71 Broadway, both of which have emerged as hugely sought-after downtown rental listings. The spacious, sun-filled lofts at 135 William Street offer Tribeca-style cool with a dead-center Financial District location. In a neighborhood marked by reinvention -- from Dutch colony to the first capital of the United States to the center of global banking and business -- the Financial District is doing it again and has gracefully remade itself as one of the finest residential neighborhoods in Manhattan. 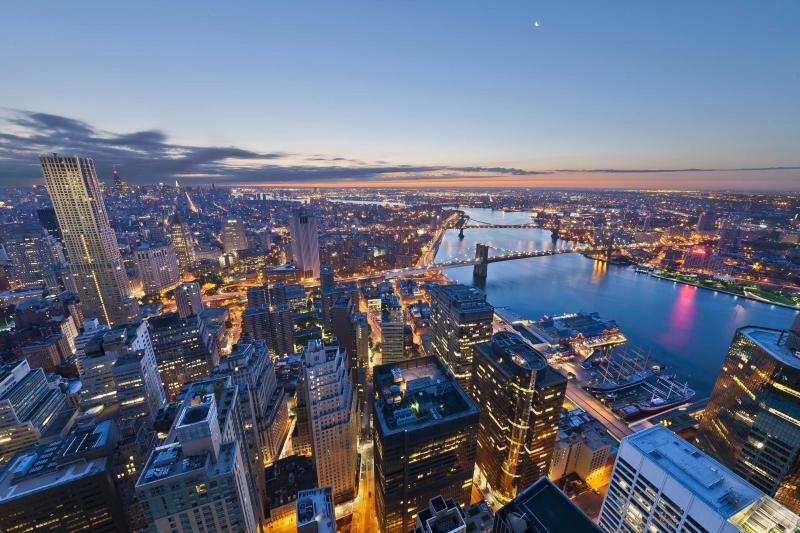 The Financial District has become one of Manhattan's hottest residential neighborhoods because of both buildings such as 2 Gold Street and such historic thoroughfares as Gold Street itself. Gold Street is one of the city's oldest and most historic thoroughfares, and it takes only a little imagination to picture it as it was centuries ago. 2 Gold Street makes for a stunning contrast in this neighborhood of contrasts this is a very modern, very elegant high-rise offering very modern, very elegant rental apartments in the heart of old New York. With one of the most well known facades in Manhattan’s Financial District, 200 Water Street stands out among residential buildings of downtown New York City. The 32-floor luxury building offers 532 high-end units for rent, along with 24-hour concierge, an on-site grocery store, valet service, and lounge space for tenants. Manhattan real estate watchers and architecture heads have been watching 8 Spruce Street, in the Financial District, for some time now. After years of anticipation, a host of name changes, and a much-watched construction process, there's at long last something to see at 8 Spruce Street -- a masterpiece of a Manhattan luxury rental, which goes by the name Beekman Tower, and is the first Manhattan rental development by Pritzker Prize-winning architect Frank Gehry. The Crest Lofts at 67 Wall Street are a perfect example of classic NYC elegance. Built in 1921, the 331 apartments inside offer New Yorkers an increasingly rare opportunity to live in a true piece of New York history with elevated beamed ceilings, oversized windows, and gourmet kitchens. Located in the heart of New York’s famous Financial District, 10 Hanover Square offers studio, one bedroom and two bedroom luxury rentals. Residents enjoy the benefits of being only one block from the East River, a stone’s throw from the New York Stock Exchange and literally around the corner from South Street Seaport. A post-war gem, the luxury rentals at 10 Hanover Square offer more than just the convenience of their location -- they illustrate an elegance that make it a premier building in one of NYC’s most exciting neighborhoods. A recently converted luxury rental, 100 Maiden Lane in Manhattan’s Financial District offers a wide range of amenities. These rentals have access to a full Atrium, a fitness center, and a fully equipped entertainment lounge. With several dining options nearby, 100 Maiden Lane is also an ideal social scene. 110 Greenwich Street is the perfect home for someone looking for a classic NYC loft in NYC's most historic neighborhood - the Financial District. This Art Deco building boasts 14’ ceilings and oversized windows with some of the most gorgeous Manhattan views you could ever hope to find of the Fulton Center’s giant Oculus, the new World Trade Center Towers, Trinity Church, the Verrazano Bridge, and more. The lofts also include exposed brick, hardwood floors throughout, and some even have private terraces.